In spring 2004 the Frida Leider Society rented rooms in the house of Frida Leider’s birth on Granseerstrasse 9, close to Arkonaplatz. After an extensive renovation the Frida Leider Centre opened on September 11th 2004. The idea was to cultivate and to maintain tradition in an active sense by providing a stage for a wide range of activities and events. In 2004 and 2005 many lectures were given. A highlight was the centre’s participation in a major cultural event held regularly in Berlin which has founded a tradition of its own: the Long Night of Museums. 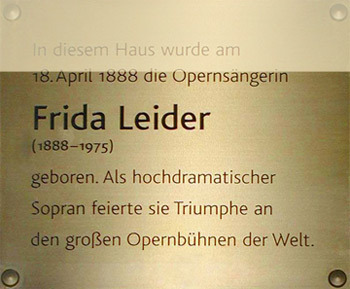 Within this context an exhibition was presented at the Frida Leider Centre which dealt with the restart of Berlin opera houses in 1945 entitled "When Orpheus began to sing again". Unfortunately we were forced to stop these activities for the moment, due to the low attendance at these events. Like almost all organisations of this kind the Frida Leider Society depends on donations to keep the centre on a long term basis and to continue with interesting activities. At the moment the rooms of the centre are only serving as archive.